How Much Is the Price of a Well-Designed Commercial Roofing System? Flat and low slope commercial roofing systems have been used for many decades on a regular basis to ensure that companies owning commercial buildings don’t have to deal with the same hassle that most homeowners are required to manage. With a reliable commercial roof, you can rest assured that your investment is protected even when your building is threatened by snow, ice, extreme rain and powerful hail storms. But how much does a commercial roof actually cost? According to most conscientious commercial roofing Colorado Springs CO companies, the prices vary too much to make an accurate assessment. 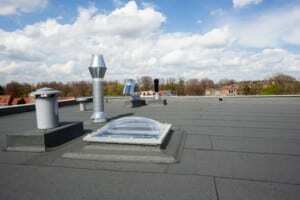 However, studies were made to track the average cost and replacement rate of commercial roofing systems. One such study has revealed that, while more than 80% of all the evaluated commercial roofs have been replaced before they should have, the price for such a replacement rarely exceeded $4-5 per foot. Even labor costs were mostly affordable, and the only aspect that made roof prices shoot up to over $40,000 was the sheer size of these roofs. An averagely sized commercial building typically requires at least 10,000 square feet of roofing material. Add that to the labor costs and various other unforeseen expenses, and you can easily look at a total price that reaches $50k. While this data isn’t conclusive, since other sources also report prices ranging between $7 and $12 per square foot, the development of new manufacturing technologies have already led to a significant price reduction when it comes to the most common EPDM, PVC, TPO and metal flat or low slope roofing systems.